Yesterday was my first ever Blogiversary (anniversary of my blog). I planned on publishing a celebratory post on the same day; however, the responses I received from sharing a heartfelt thanks to my readers, social media followers and fellow bloggers on my Facebook page and Google Plus stream thoroughly distracted me from any sort of legitimate writing. In the end, I chose to spend yesterday thanking those who had helped me learn to build my blog, smiling so much my cheeks ached and celebrating in my own way. Mostly by going on a long walk by the lake, drinking red wine, cooking a roasted chicken, and playing a computer game. 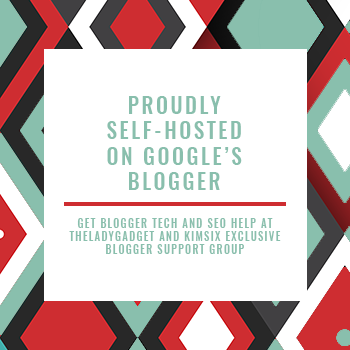 But, my Blogiversary celebration wouldn't be complete without showing gratitude to the most important people associated with my blog—the readers. In other words, YOU. Whether you're a long-time reader or a new visitor, I thank you from the bottom of my heart. 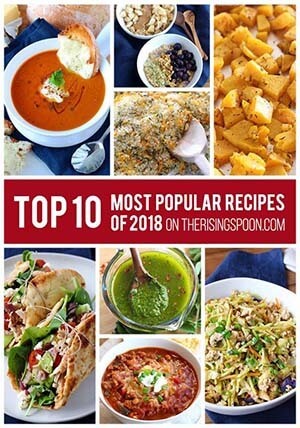 I created The Rising Spoon to share all the knowledge, tips, tricks, recipes, and recommendations I've picked up over the years in my self-taught cooking journey. My goal is to inspire folks to cook wholesome, homemade food on a regular basis, and learn about ways to live a more non-toxic stress-free life. Basic food knowledge and cooking techniques are dwindling as the years go by and people become more accustomed to ready-made, processed foods. I aim to combat this trend by doing my part to show how easy it is to make simple real food meals at home with quality ingredients. And as a further way to say thanks to all of you for supporting my blog, I'm hosting my first ever paid giveaway on Monday. No sponsors, no companies—just me paying for an awesome product that one of you lucky readers will win. Now onto the darn recipe! 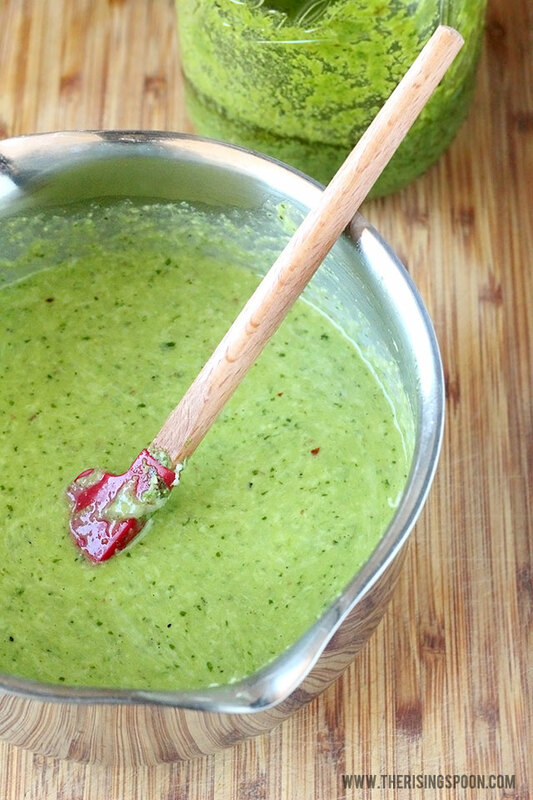 I love making homemade pesto all year long with either kale or basil. It's so quick and easy + you can swap out a bunch of different ingredients. However, when it comes to pasta, I'm a fan of the saucy and cheesy types, so I wanted a way to stretch that pesto further. 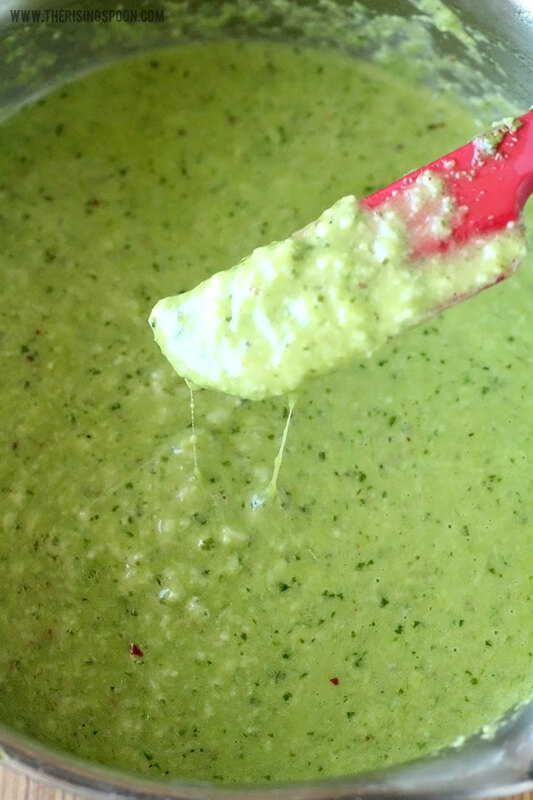 Enter this quick and easy creamy pesto sauce! My version is inspired by The Pioneer Woman's recipe for pasta with pesto cream sauce. I don't usually have parmesan or heavy cream on hand unless I'm using it for a specific recipe, so I switched up the sauce with two of my pantry staples: canned coconut milk and a block of mozzarella cheese. I also made a batch of homemade pesto a few minutes before (doubled so I'd have leftovers), so it was super easy to throw together. I often substitute canned coconut milk in recipes because other milk, like heavy cream, half & half, and buttermilk, tends to expire before I can use it. It's also a little easier on my stomach in large amounts (versus heavy cream), but as you can see this recipe isn't dairy-free since I still use grass-fed butter and mozzarella cheese! My favorite way to use this sauce is on warm pasta, specifically Creamy Penne Pasta with Tomatoes & Asparagus. It's a perfect blend of spring & summer flavors. I'd eat it all year long if I could. If you're making this sauce because it's specifically gluten-free, there are a wide range of yummy gluten-free pasta options now like jovial's brown rice pasta or tolerant food's red lentil pasta. Zoodles would work, too! 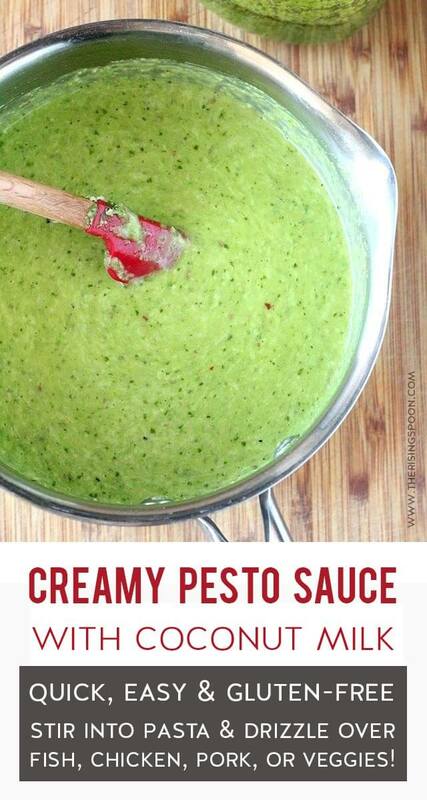 For non-pasta ideas, drizzle this creamy pesto sauce over any cooked meat, fish, veggie, or starch/grain. Think pan-seared salmon, grilled chicken, sauteed shrimp, pan-fried pork chops, grilled zucchini or vegetable kabobs, sliced heirloom tomatoes, roasted tomatoes with fresh herbs & garlic, roasted potatoes, white rice, quinoa...the possibilities are endless! 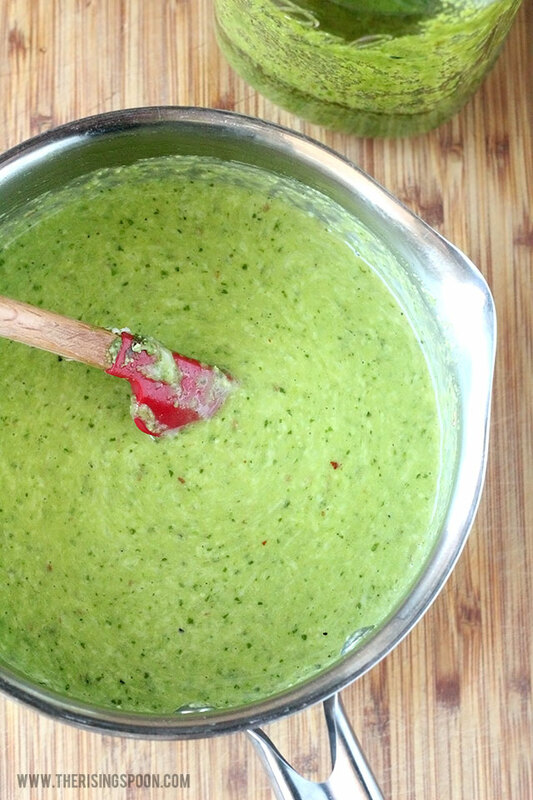 If you don't have pesto already made, do this first. The rest of the recipe comes together quickly. Once that's complete, heat a small saucepan on medium-low and slice off about three tablespoons of butter into the pan. While that's melting, open a can of coconut milk. If there is a thick layer of cream on the top, either stir to recombine with the rest of the milk or scoop it off and store in a separate container to use for coconut milk whipped cream. Stir 1/2 a cup of the coconut milk into the now melted butter. Pour in the pesto and stir to combine. Smells wonderful, eh? Sprinkle in some sea salt, freshly ground black pepper and crushed red pepper flakes. Once the sauce is warm (not boiling) reduce the heat to low and slowly stir in the cheese a bit at a time until it's all melted. 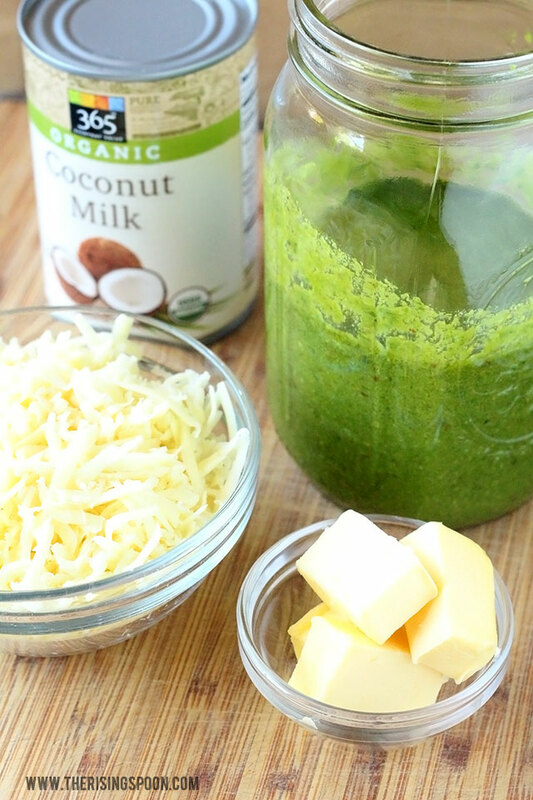 Pour the sauce over your favorite dish while still warm and serve immediately! Click Here To Pin This To Your Sauce Recipes Board On Pinterest!